Caption slip reads: "Photographer: Sansone. Date: 1952-03-17. Reporter: T. T. Assignment: Purple Heart Commander. Victor F. Kubly, National Commander, Military Order of Purple Heart, at Biltmore Hotel. He is on national tour. 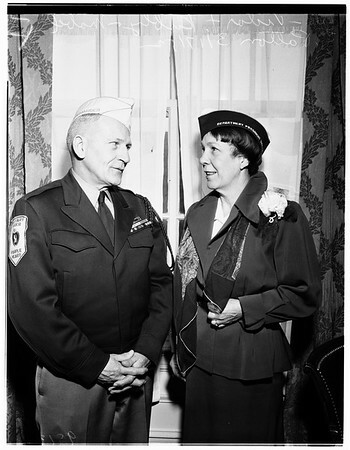 11/12, L to R: Victor F. Kubly & Mabel E. Patton, President, Ladies Auxiliary, Calif. Dept., Military Order, Purple Heart".